Let me ask you a question, and let’s be honest, how many times have you seen a business post on Facebook and you wished there had been an eye-roll button to click? People on Facebook value meaningful, informative stories. In their algorithm, Facebook looks at a user’s personal signals, such as “how close someone is to the person or page posting, stories they’d want to talk to their friends and family about, spend time reading, and videos they’d spend time watching.” Also taken into account is the post’s overall engagement. People value content that is informative as well. Think about what you take time to read or share, or even comment on. It is content you find meaningful and informative. You should put yourself in the your audience’s shoes and post the type of content they will spend time on, much like you would. People on Facebook value accurate, authentic content. Clear headlines – do not mislead the person viewing the headline. Accurate Information – make sure what you are posting is true. 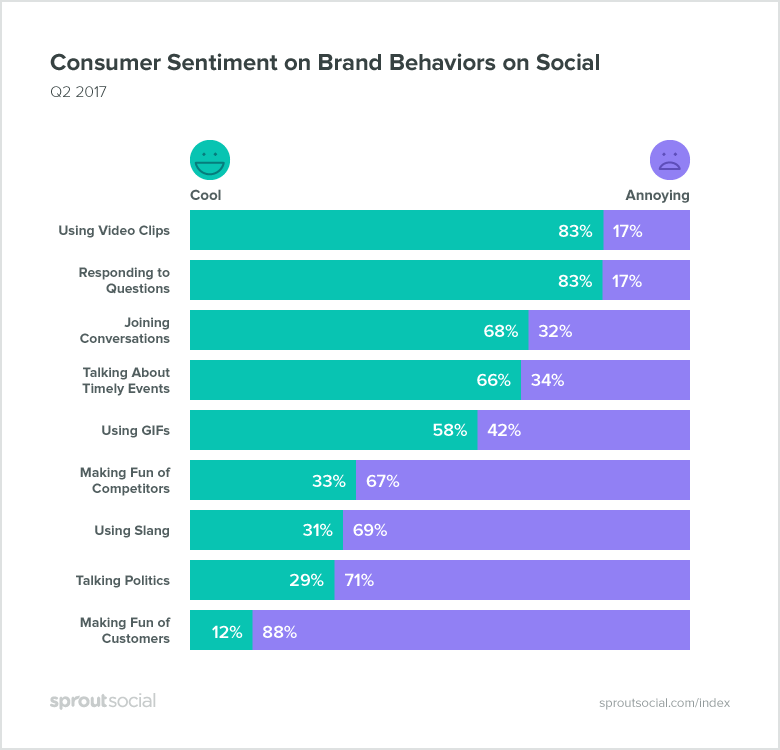 Around the same time as the Facebook release, Sprout Social released its Q2 Sprout Social Index. 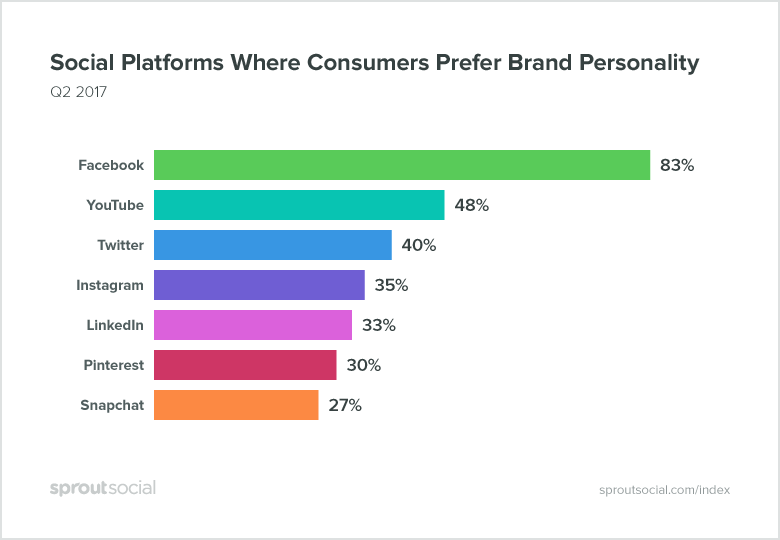 This edition of the quarterly social media insight report focused on what consumers are looking from from businesses on social media – and it echoed a lot of the Facebook release. Every business wants to be ‘cool’ on social media – they want to relate to their fans, but there is a limit to that. 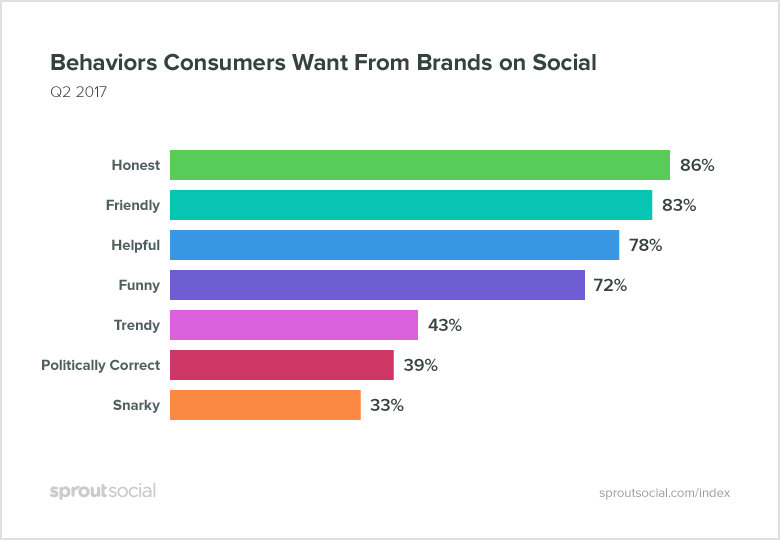 According to the Sprout Social Index, social media users want brands to be honest online, you know, authentic. They also want you to be friendly and helpful, not snarky and sarcastic. You can leave that for your private personal channels. Of course, where else do social media users want to see this honest behavior? Overwhelmingly Facebook. If anyone, professional or not, tells you Facebook is dead and you need to look elsewhere, run and run fast. Let’s talk content – what TO and NOT TO post. TO Post: Meaningful, informative stories. This could include tips, articles – items that are relevant to your fans. What this is NOT is sales pitch after sales pitch or “look at what we do” post after post. I see so many businesses doing that and it’s annoying. Stop the constant self-promotion and build the relationship! Example: You are a pediatrician office. The content that would be meaningful and informative to your fans would be articles that keep your fans informed on the latest research on vaccines or when your office will be having their annual flu clinic. TO Post: Accurate, authentic content. Example: You are a restaurant. The accurate, authentic content that would be relevant to your fans would be your updated menu and pricing and any specials you may have. NOT TO Post: Political commentary. 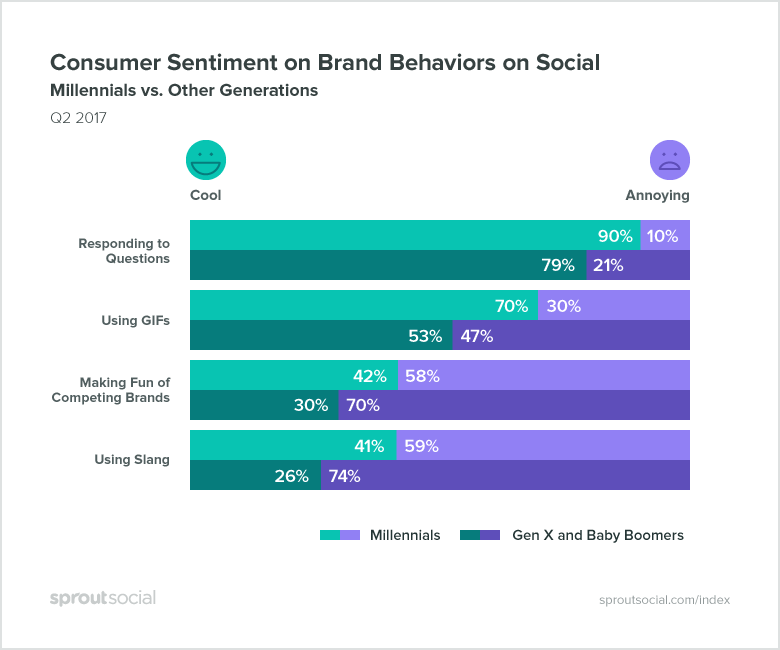 According to the Sprout Index, “Seventy-one-percent of consumers surveyed think political commentary from brands is annoying.” In this day and time, the ground is too shaky to endeavor on posting this type of content. Unless that is your business, steer clear. NOT TO Post: Making fun of customers. You would think this is a given, but some businesses do it. As seen below, 88% of consumers find it annoying. TO Post: Responses to questions. It should be a given to respond to questions to that are asked, however you would be surprised how many go unresponded to (and I’ve had this happen to me!). 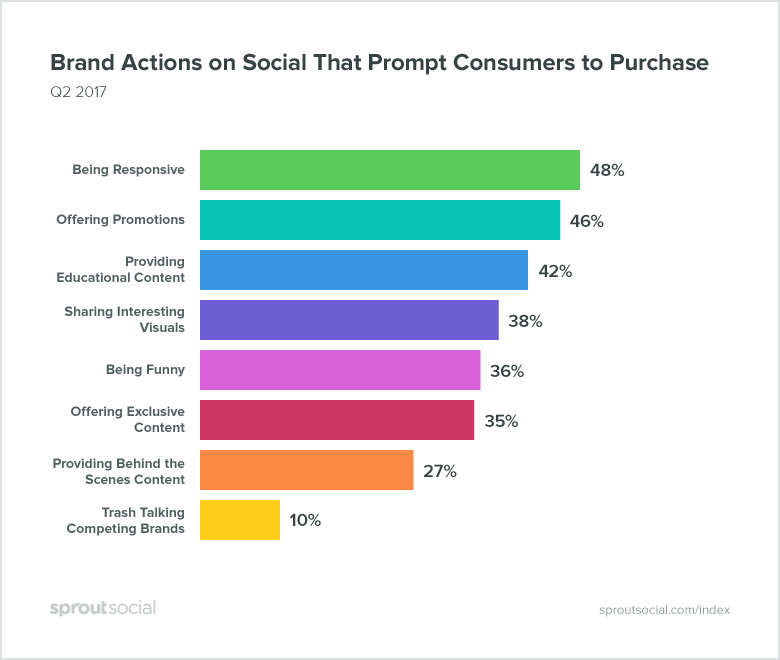 According to Sprout Social, 68% of consumers want brands to participate in conversations they’re mentioned in, and 83% want brands to respond to them. You may think it’s cool to use the lingo of a particular generation, but most generations find it annoying. See the graph below. 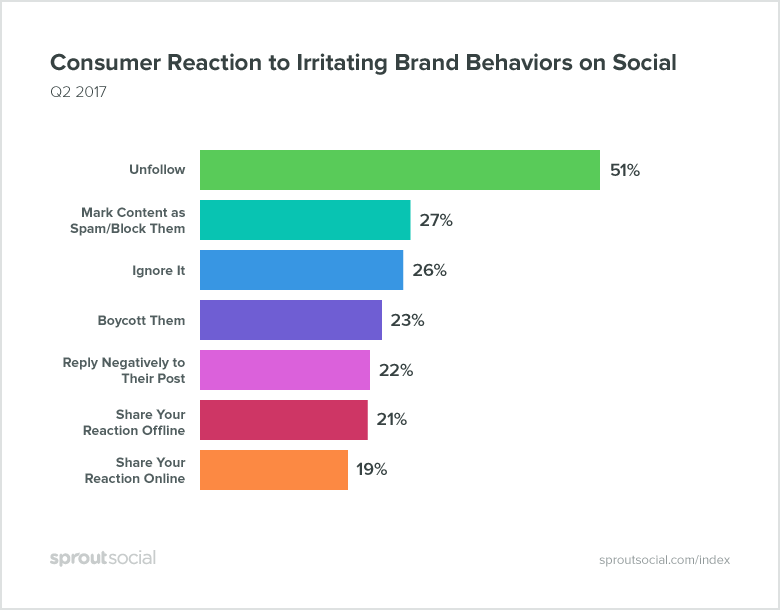 So what happens if a business is posting content that their fans find annoying or uninformative? They are unfollowed or marked as spam. I’ve done it. You’ve done it. Your mom probably has done it too. The problem is that many businesses just don’t care – or they do not know better to know how to correct what they are doing wrong. Tying this all up, if your business is posting meaningful, accurate content that shows you are honest and you are being engaging and responsive online, you are on the right track. Of course, all of this should relate back to your overall social media strategy. 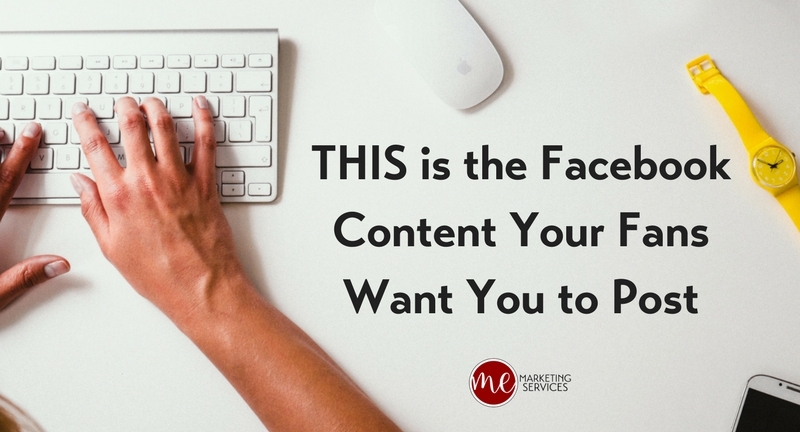 What types of content have you seen on Facebook that has made you cringe or made you want to give that business a high-five? Share with us in the comments! This article originally appeared in ME Marketing Services, LLC. This article was written by Mandy Edwards from Business2Community and was legally licensed through the NewsCred publisher network. Please direct all licensing questions to legal@newscred.com.